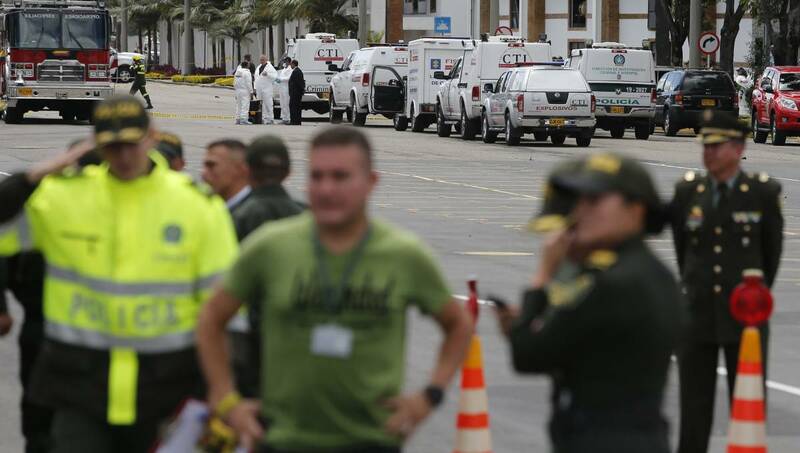 A car bomb exploded at a heavily guarded police academy in Colombia's capital on Thursday, killing 10 people and injuring dozens in an attack that recalled the bloodiest chapters of the country's drug-fueled guerrilla conflict. The scene outside the General Santander police academy in southern Bogota was chaotic in the aftermath of the midmorning attack, the biggest against a police or military facility in Bogota in years. Videos circulating on social media show panicked officers hauling injured colleagues on stretchers with debris and body parts strewn in front of red tile-roofed cadet barracks. In the distance, the skeletal steel remains of the truck used in the attack can be seen still burning while approaching ambulances blare. President Ivan Duque rushed back to the capital with his top military advisers from a visit to a western state to oversee the police investigation, which points to a possible suicide bombing - something unprecedented in decades of political violence in the Andean nation. Chief Prosecutor Nestor Martinez said a 56-year-old man named Jose Aldemar Rojas, driving a 1993 Nissan pick-up loaded with 80 kilograms (175 pounds) of pentolite, carried out the attack. He said the car had its last official mechanical revision some six months ago in the eastern state of Arauca, along the border with Venezuela. "This is an attack not only against the young, the security forces or the police. It's an attack against society," Duque said in a brief statement after surveying the blast scene. "This demented terrorist act will not go unpunished." The defense ministry said 10 people were killed and another 66 injured. Among the dead were a Panamanian and an Ecuadorian national. "I'm sad and very worried because I don't have any information about my son," said Trujillo, standing outside the facility, where police officers had set up a taped perimeter as forensic specialists surveyed the blast site. Authorities were at a loss to explain how the vehicle slipped through a gate permanently protected by explosive-sniffing dogs, heavily-armed guards and security cameras. But there were unconfirmed reports based on leaked recordings of phone conversations of officers on the scene that the driver rammed through the checkpoint on a kamikaze mission. Health authorities in Bogota appealed for residents to donate blood at one of four collection points in the capital to help treat those injured, the majority of whom were rushed to a police hospital. While authorities had yet to suggest who was behind the attack, and no armed group claimed responsibility, attention was focused on leftist rebels from the National Liberation Army, which has been stepping up attacks on police targets in Colombia amid a standoff with the conservative Duque over how to re-start stalled peace talks. Several foreign leaders condemned the attack, as did the former commanders of the disbanded FARC. The United Nations peace mission in Colombia called it "an unacceptable criminal act which goes against the efforts the country is making to steer away from the violence, and work ... to build a more prosperous and peaceful future." An explosion at the upmarket Andino shopping mall in June 2017 killed three people, including a French woman, and injured another 11. Police later arrested several suspected members of a far-left urban guerrilla group called the People Revolutionary's Movement for the bombing. "We need to fortify the city again," he told Blu Radio. Videos circulating on social media show panicked officers hauling injured colleagues on stretchers with debris and body parts strewn in front of red tile-roofed cadet barracks. In the distance, the skeletal steel remains of the truck used in the attack can be seen still burning while approaching ambulances blare.